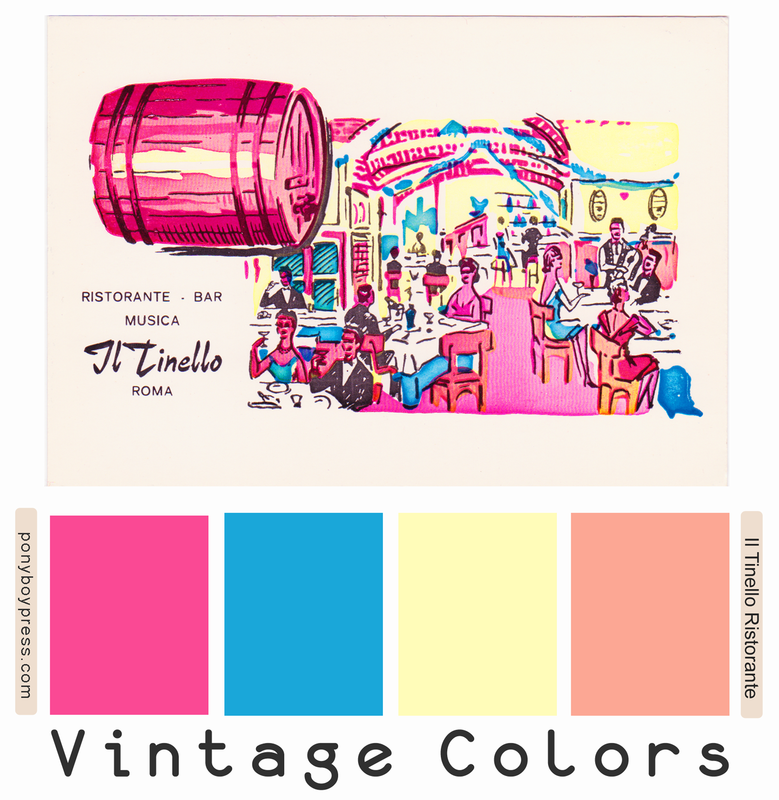 The Vintage Color Palette today comes from a postcard from the 1930's or earlier. 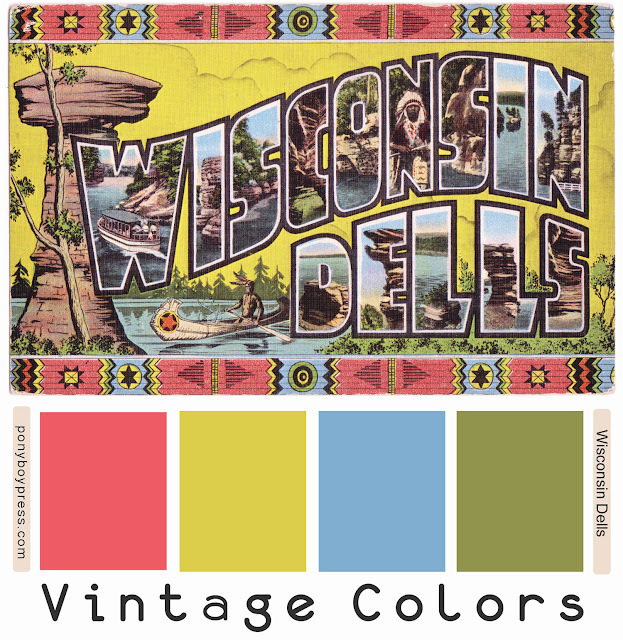 This big letter postcard from the Wisconsin Dells has a really inspiring color palette. 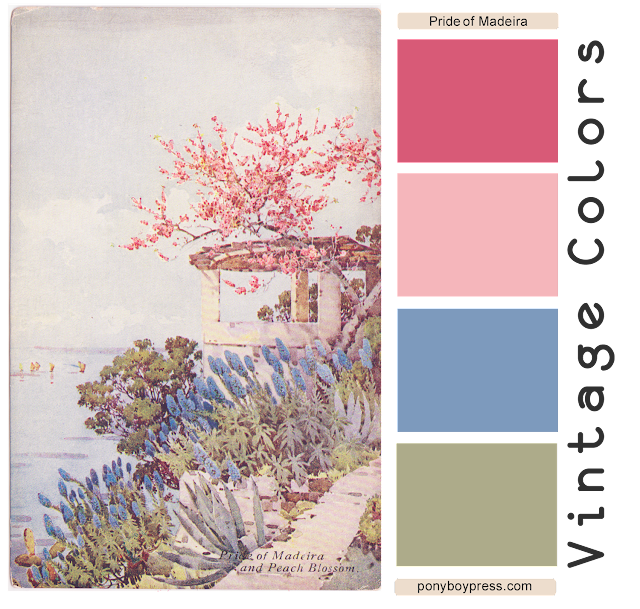 I love the rosey-coral with the acid yellow and the mellow blue. And I always love a good vintage olive color. A great combination that would look awesome on pottery, packaging or in vintage home decor. Just for fun,I found a site where you can match interior paint colors to the hex color code numbers. I randomly chose the Benjamin Moore Color Collection. What the site will do is give you the closest four matches and it shows you the RGB breakdown so you can see easily how they differ. 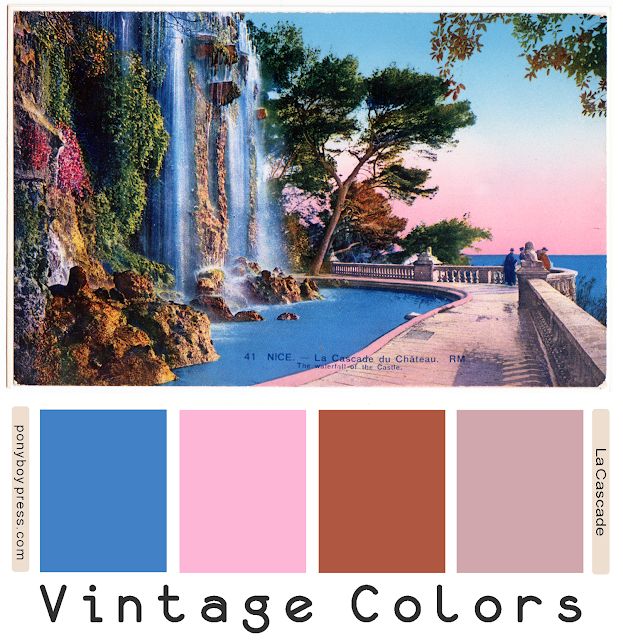 Here are the Benjamin Moore paint colors to match this palette. Pretty great matches. 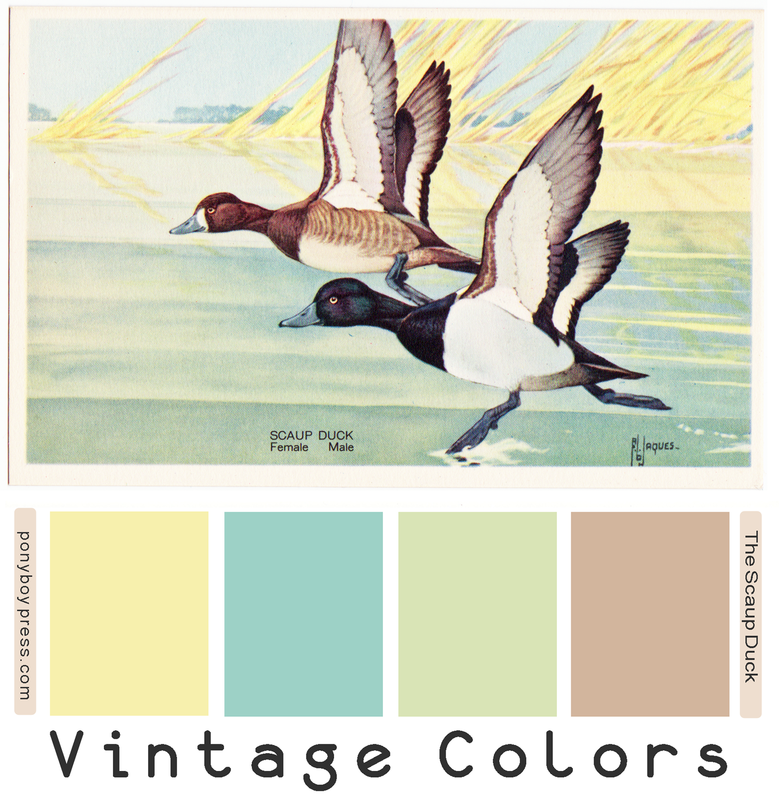 Now you can find your favorite Vintage Color Palette (browse quickly on Pinterest) and start painting your walls. 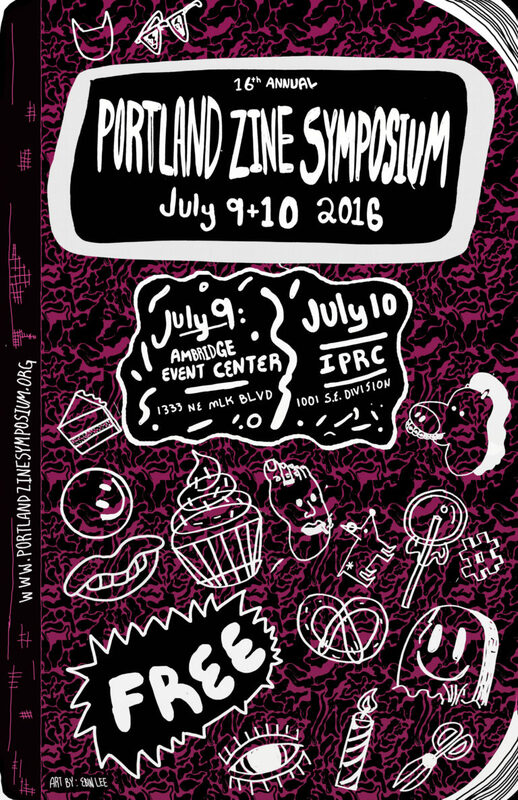 Portland Zine Symposium this Weekend! 3 New Zines! 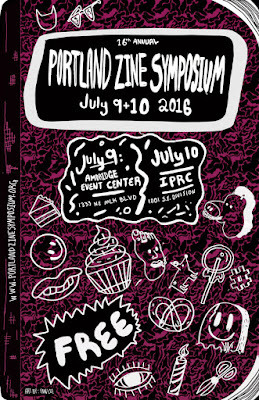 The Portland Zine Symposium is this weekend and I will be there at the Ambridge Event Center on Saturday. This year the Sunday event will be only workshops and will take place at the IPRC. 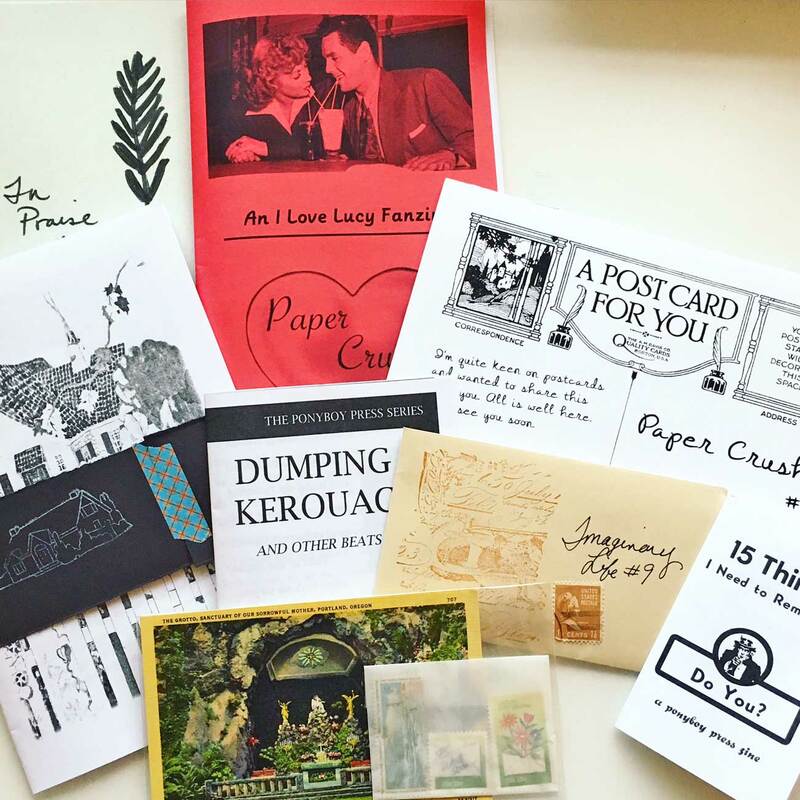 So, if you want to buy zines you have to go on Saturday. Doors open at 11 a.m. and it's free. I have three small zines that are new and have some more copies of last years I Love Lucy fanzine that I sold out of last year. 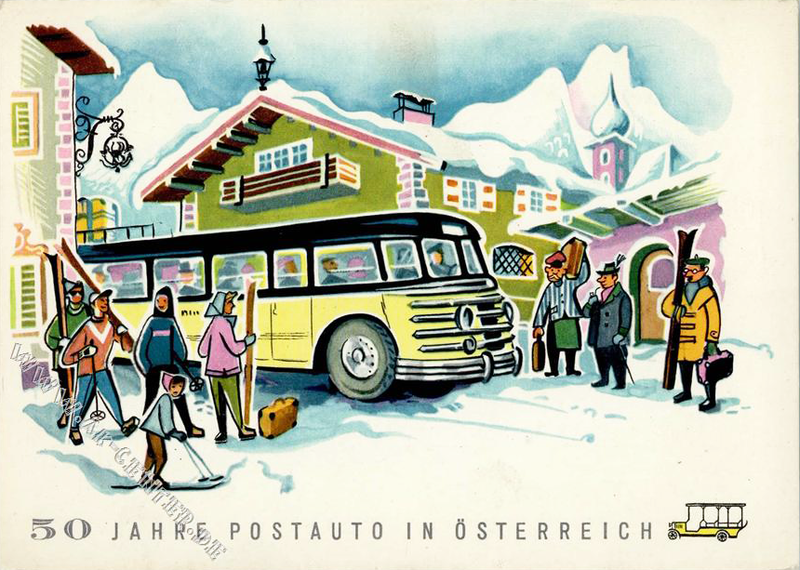 I will also have a small collection of vintage postcards with vintage stamps you can use to mail them. Hope to see you there! 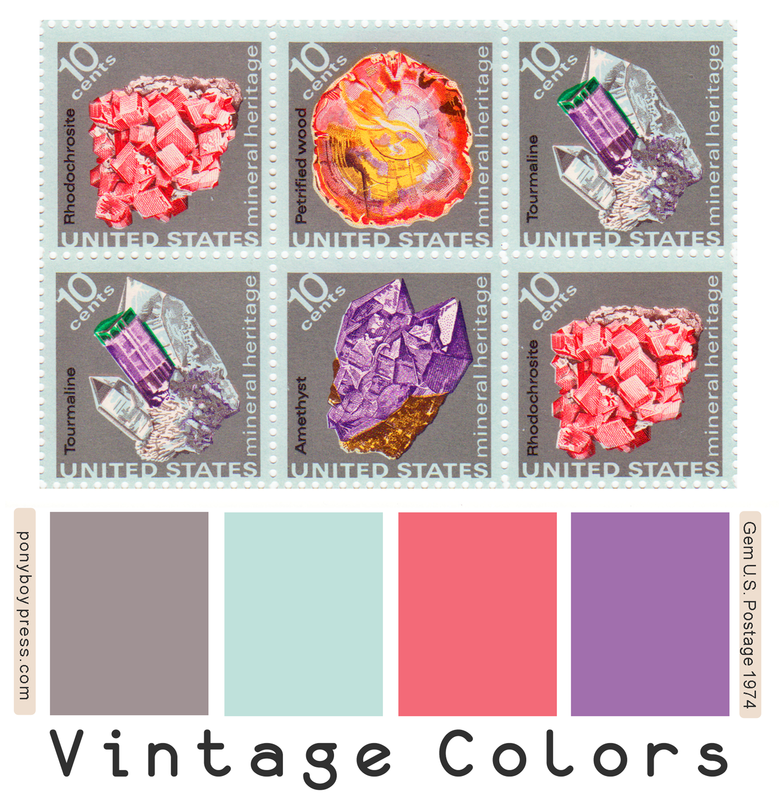 Read more here if you're not sure how you can use the Vintage Color Palettes? 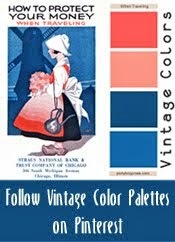 Follow Vintage Color Palettes on Pinterest. 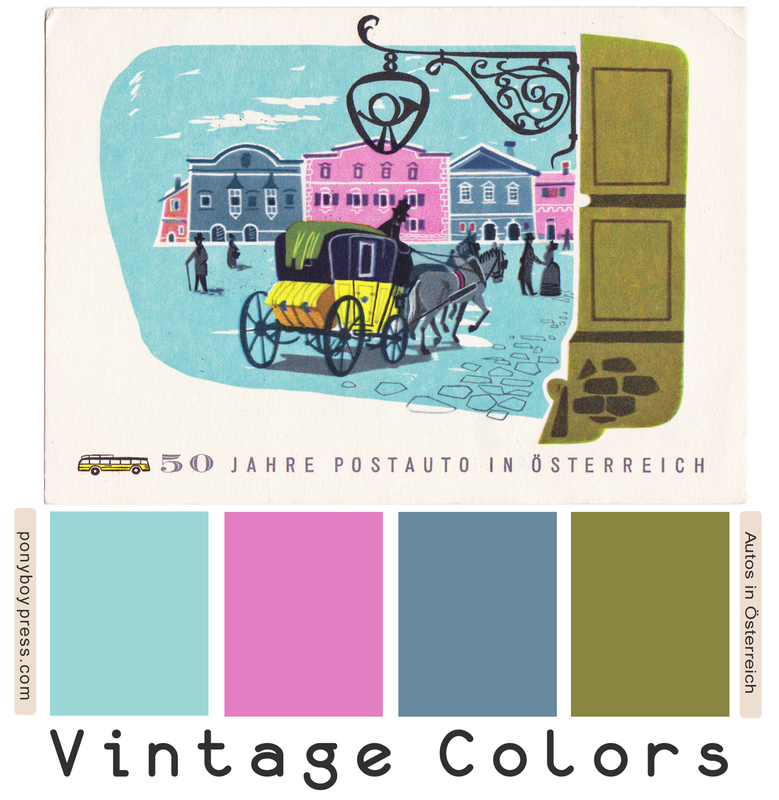 This pretty vintage color palette comes from a 1957 postcard celebrating 50 years of the automobile in Austria. 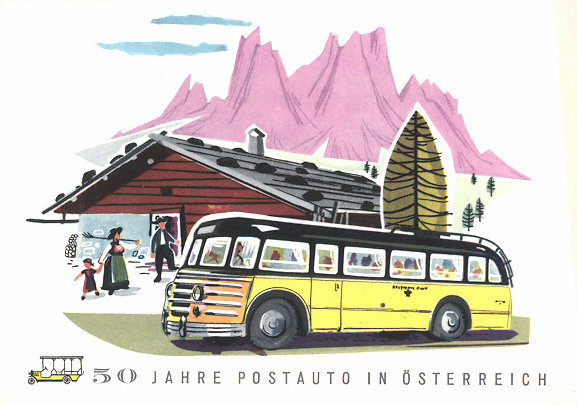 I love this illustration and the choice of colors used. 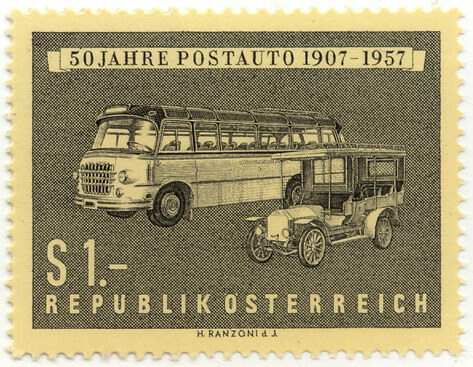 I did some research and found other postcards and stamps commemorating the same thing. These illustrations are so great. See below for images I found on the internet. I believe that artist for the postcards is Atelier Harnisch. The hex color codes for this VCP are from left to right: 9bd6d7, e47ec3, 678a9f, 89873f. Not sure what you can do with these? 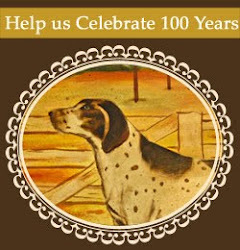 Use your VCP of choice to design web colors, logos, patterns, room colors, any design or color work. Want to get more ideas. See this post on Using Vintage Color Palettes. Find more by clicking on the tag or on see our Vintage Color Palettes on Pinterest. This vintage color palette is super interesting. 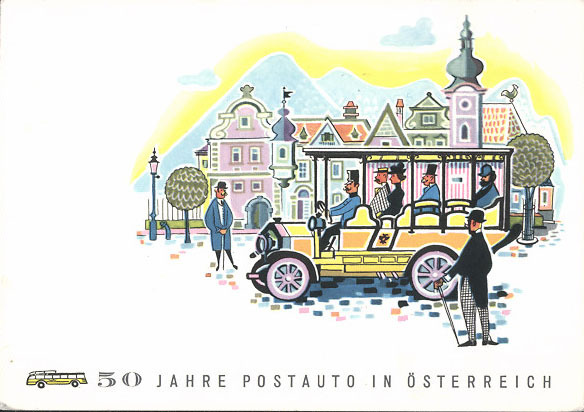 The postcard was made for the Century of Progress Expo which was held at the 1933 Worlds Fair in Chicago. This was The House of Tomorrow. This house was what they envisioned for the future. The inside looks pretty mid-century and not that surprising from what I saw online. The garage has a pace for a small airplane. 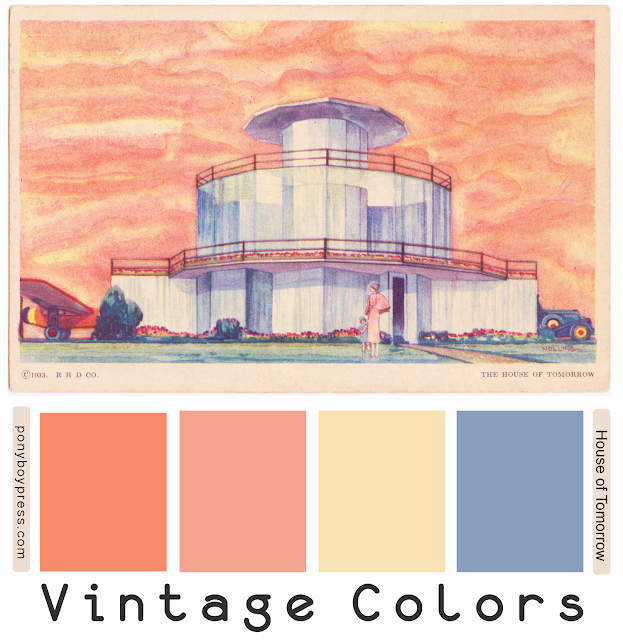 The color palette must have been what they also envisioned for the future. It evokes luxury, ease and modern technology. I really like this combo. I think it would be great in a wallpaper pattern. Here is an photo of the house from The Worlds Fair. 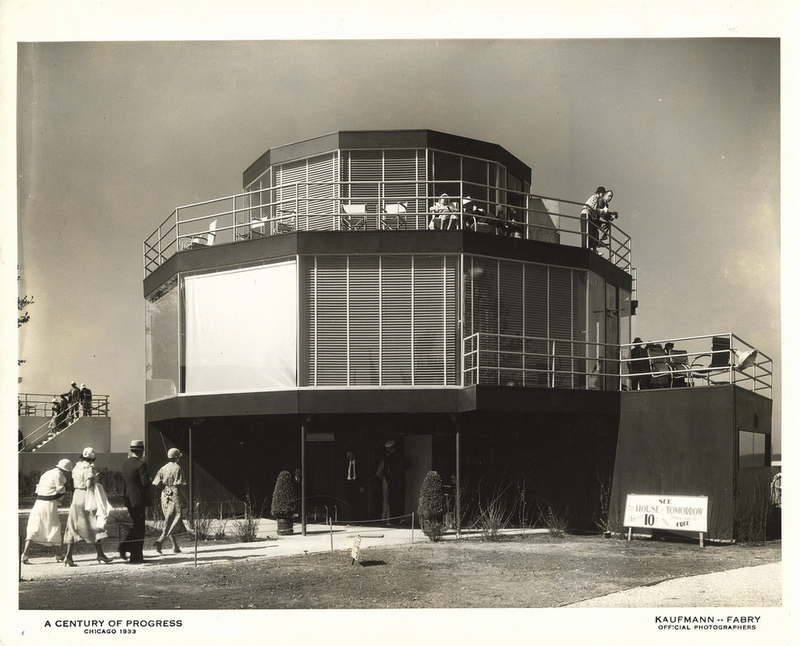 Built for Chicago’s 1933-34 Century of Progress International Exposition, the House of Tomorrow showcased modern home convenience and creative practical new building materials and techniques to nearly 50 million visitors. This three-story, 12-sided house of the future held was made of steel and walls of glass with modern technologies like air-conditioning, a dishwasher, electric “eyes” to open the kitchen and garage doors and a built-in airplane hangar. I love how the color choices of this postcard from the early 1900's make this waterfall at the castle look like it's on another world. Such an interesting combination of colors that you wouldn't think go together, but they work so well to convey the magical feeling a person must experience there. Last March I joined the first year of the Portland Correspondence Club (PDXCC). 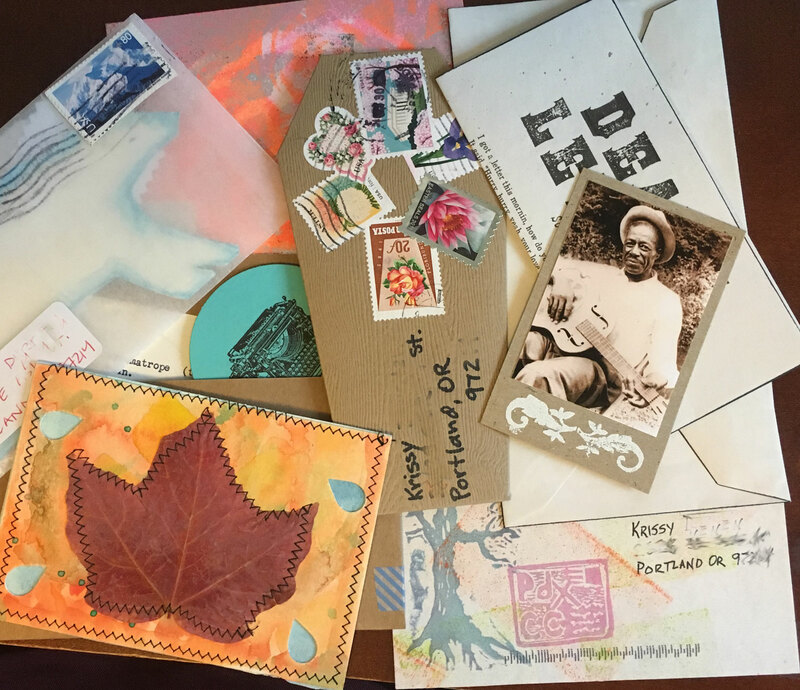 It was started in January of 2015 by two mail artists and it's held at the IPRC in Portland. 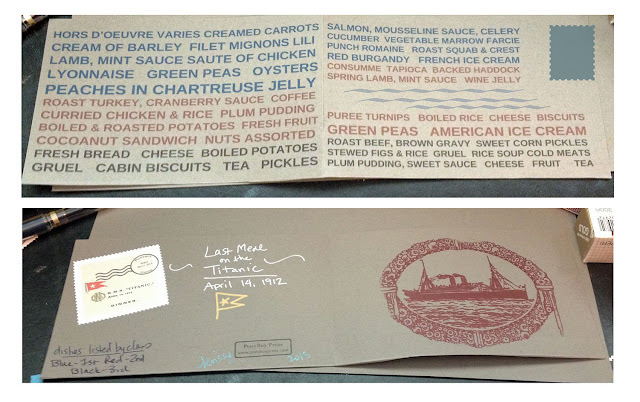 I met Niko, one of the founders, at the Portland Zine Symposium the summer before and he somehow knew I would love mail art, even though I had never done it before and I didn't think I was that into it. Niko invited me to join and finally after missing the first three months I went to a meeting and found my people and a fun new hobby. 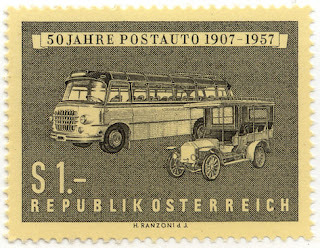 Mail Art people are into mail, envelopes, office supplies, stationary, stamps, stamp pads, typewriters, history, snail mail, writing letters. 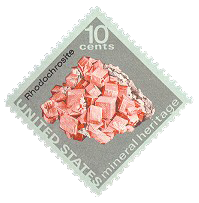 They're the kind of people who squeal with excitement over a box filled with vintage penny stamps and who hoot and applaud a mailman when he's introduced to the group. Mail Art people understand when I swoon over a certain washi tape or a get a little obsessed with fountain pens. They get me. 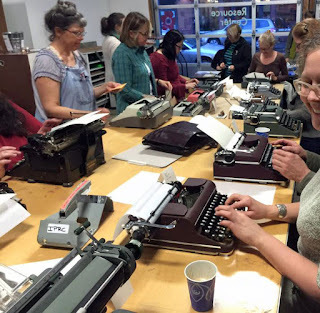 The club meets once a month and each meeting usually includes a few to several vintage typewriters you can use, often there is a skill share or project, but mainly we visit and exchange our faux postage made for that month. 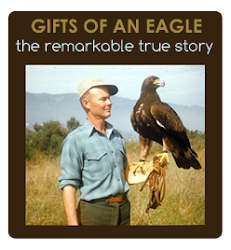 Each member gets a passport book and people who make stamps each month put them in your book and often cancel them. It's damn official and fun to see what everyone makes. Every month members can choose to be a part of the monthly mail art exchange based on a theme. This was my first project. The theme was food and this was a study on the different menus on The Titanic. It folds and I sealed the sides before sending. 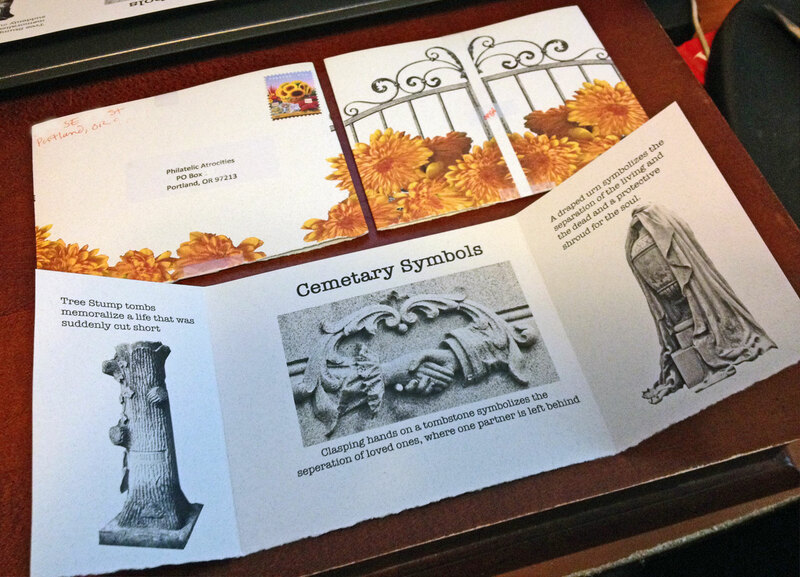 Here are a few of the mail art projects that I received from other members. Everyone likes getting fun things in the mail. If this interests you, there might be a correspondence club near you. I know there is one in San Francisco and Olympia, Wa.